Welcome, faithful readers (and those of you joining us for the first time) to the 121st installment of Cover Stories, the weekly column in which I, Jon B. Knutson, present a group of covers with a common theme! This week's promised theme is "Cartoon Stuff," and you may have been wondering what the heck that means? Well, there's two ways to look at Cartoon Stuff.. but a bit of preface, first! Today's superheroes are very serious, if not entirely grim and gritty, with no sense of humor whatsoever. Their villains tend to be the evilest of the evil, killing and perpetuating other vile crimes. There's very little humor to be found, for the most part! 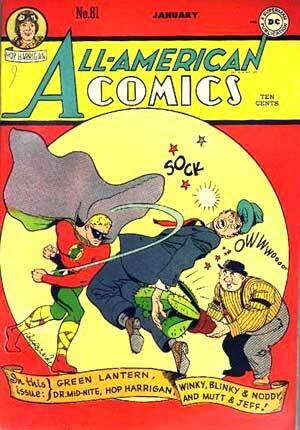 All-American Comics 81, cover-featuring the Golden Age Green Lantern and his sidekick, Doiby, are definitely combining serious with a cartoony effect - namely, the cactus that Doiby's using on the bad guy. Of course, in cartoons, when a character sits on or backs into a cactus, they tend to jump WAY up in the air, but this guy is apparently too knocked out to do more than say "Owwwoooooo!" Kind of mean of Doiby, don't you think? And does he carry that cactus in the back of his cab, Goitrude, just in case this kind of situation comes up? This cover was rendered by Paul Reinman. Inside, GL headlined "Two Twisted Twerps" by John Broome and Reinman, followed by some Mutt and Jeff newspaper reprints by Al Smith; Winky, Blinky and Noddy in "I've Decided to Become a Millionaire" with art by Harry Lampert; Dr. Mid-Nite in "Say It With Flowers" with art by Stan Aschmeier; the text feature "The Lore of the Blackfeet" by John Osgood; and Hop Harrigan in "Kamakura Capers" by Jon L. Blummer. The other side of "cartoon stuff" on comics covers is when machines act alive, not too dissimilarly from Benny the Cab in "Who Framed Roger Rabbit?" or even the characters in the movie "Cars"! And these kind of covers aren't just limited to the Golden Age, either... even in the Silver Age (an era, frankly, known for some of its goofiness), you could find machines that were alive! Yes, Smallville, that tiny little town that's either near the East Coast, not far from Metropolis, or in Kansas, quite a ways from Metropolis, or in Kansas but maybe an hour's drive from Metropolis (depending on what you're reading or watching and how much you believe them... DC geography tends to be rather elastic in its history)... for whatever reason, Smallville attracted more than its fair share of alien invaders... and on the cover of Adventure 306, fantastic creatures take over all the objects in town, like the Kent's car, a street corner clock, and even the entire Courthouse! This cover was wonderfully created by Curt Swan and George Klein. Inside, "The 5th Dimensional High-School" leads off the issue, and I'll bet you can figure out who's behind the cartoonization of Smallville's inanimate objects, can't you? That tale was by Otto Binder and George Papp. This is followed by a Casey the Cop filler by Henry Boltinoff, and the issue is wrapped up with The Legion of Super-Heroes in "The Legion of Substitute Heroes" by Edmond Hamilton and John Forte! 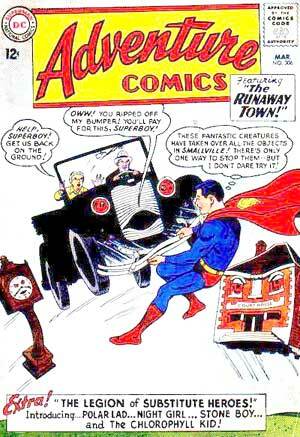 That latter story has been reprinted in Adventure Comics #500, DC Special Blue Ribbon Digest #1, and The Legion of Super-Heroes Archives Vol. 2! Of course, when it comes to stuff that's a bit unusual, one really needs to look at Fawcett's Captain Marvel and family... check out the cover for Captain Marvel Adventures 84! Captain Marvel's definitely got his hands full in Station WHIZ, doesn't he? Even the garbage can has come alive! And it's all thanks to "The Surrealist Imp!" Who is the Surrealist Imp? I'm guessing he's kind of like Mr. Mxyzptlk (or however his name was spelled back then). C.C. Beck did the cover for this issue, and as you may recall from the 1-10 I did of Captain Marvel Adventures a column or three ago, most of the stories are uncredited and untitled! The lead tale, "The Runaway Steamshovel," was written by Otto Binder; then there's a filler, "Rock-a-Bye Baby" with Billy the Kid and Oscar; "Billy Batson's Phobias" written by Binder; "Willie the Worm Gets Artistic" (a non-Cap filler story); "The Surrealist Imp"; another filler, Fuzzy Bear in Something to Cry About"; the text feature "Invisible Man of Mars" featuring Jon Jarl by Otto Binder (writing as Eando Binder); "Captain Kid and the Lost Job"; a Dopey Danny Dee filler, "Hang-er It All! "; a Tightwad Tad filler, "Not So Cracked"; Captain Marvel in "The Feud with the River"; and Sherlock Monk in "One in a Thousand" wraps up the issue. 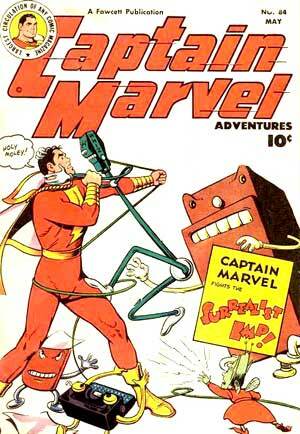 Even Captain Marvel Junior dealt with machines that were alive! Check out Master Comics 86! Junior seems rather surprised to be there, doesn't he? This is even more like a character stepping into a Looney Tunes cartoon, don't you think? Actually, this cover reminds me of Jingle Jangle Comics, but I digress. This cover was rendered by Bud Thompson. 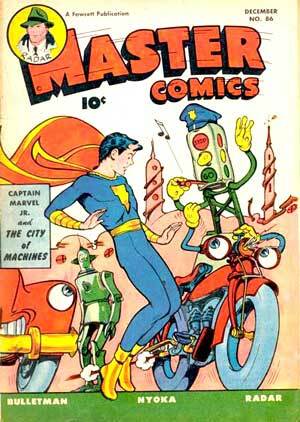 Inside, as you might suspect, Captain Marvel, Jr. leads off in "The City of Machines." This is followed by Nyoka the Jungle Girl in "The Jungle Water Creek"; Colonel Korn and Korny Kobb in an untitled story; Bulletman - er, Bulletgirl - in "The Deadly Masquerade"; the text story "Bloobstutter, the Bandit" by Rod Reed; and finally Radar, International Agent, in "The Pasha's Decision."